Why is CD-i support in MESS Emulator limited? It seems we don't have to expect big updates on the MESS CD-i driver, because the author struggles to understand the system. It's a very complex system and if CD-i Fan wasn't around to help there would probably no CD-i MESS driver at all. A few paragraphs to display the current situation. Why is CD-i support in MESS Emulator limited? "Because to work on the current CD-i driver any further [is very difficult]. I'll be happy to look into it if anyone ever procures dumps of the internal ROMs for the various peripheral MCUs that correspond to the specific CD-i board revision that MESS currently emulates, but beyond that I'd just be piling even more hacks on top of what is already a hack." ... "From what I can see the games for the system are designed in a fairly abstract manner, near enough an old style sandbox, designed to survive hardware changes because Philips designed it as the ultimate 'future-proof' multimedia system (however foolish that ended up being). There are probably a few key bugs in the implementation causing the vast majority of the problems. It's an impressive driver, don't get me wrong, but from my own study of it I don't feel it actually *needs* the internal ROMs to improve compatibility, afaik the standalone CDi emu does fine without them." "To be quite honest, it is a very simple system, at least the Mono-II. The real problem comes from the abstraction that you mentioned above. By virtue of all of these different games going through the same core I/O functions that are supplied by the BIOS, there is an enormous lack of test cases. I have a bunch of CD-i games that all hit the hardware in more or less the same way." CD-i Fan: "I have no more chip documentation then you do, in fact I originally had less since I worked on a different board (MiniMMC, it uses the (at the time) undocumented 2xVSC+VSD chips instead of the documented VDSC). My only "plus" is some years of headstart and a very good familiarity with the system as a developer. It does make me wonder where MESS CD-i would be without me; I think both emulators ended up better as a result of it. All of that aside, I sincerely believe that most current emulation bugs (in either emulator) would not be easily solved even with the contents of the internal ROMs; these bugs are probably only peripherally related to the contents of those ROMs." "By contrast, I see the CD-i as a crap console that has only gone unemulated in an open manner for so long because people care so little about it. It's not a coincidence, in my opinion, that both more-popular and less-popular consoles and computers have been emulated in MESS. That both more-complex and less-complex systems have been emulated in both MESS and MAME. I was interested in emulating the CD-i because despite not knowing the ins and outs of all of the different CD-i platforms that you have emulated, I sincerely doubt that any of them are more complex than the Nintendo 64, so it seemed like a pretty simple target to hit until I found out that nobody ever bothered to leak any significant amount of register-level programming documentation." CD-i Fan: "On the technical front, it's inherent in emulating CD-i. It's hard to get accurate low-level emulation with the amount of undocumented hardware in the system; reverse engineering and HLE is the only way that functional emulation can be achieved for a reasonable cost (time or money). I know that HLE is not the MESS way, but in this case it can't be helped. CD-i as a system is certainly way below the complexity of modern or even many older consoles, which makes it all the more challenging to get it properly emulated. That little register-level documentation was ever leaked is a consequence of the basic design of CD-i as a software API; to me as a software engineer it seems a better way then just fixing the hardware as so many contemporary consoles did. At the quality level, I think that the current CDIC emulation in MESS is essentially identical to that in CD-i Emu; there are still some problems in both emulators but I currently have no more ideas about fixing that then you do. 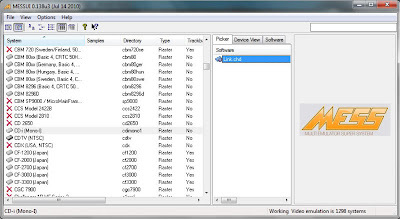 I do not think that the CPU, VDSC and SLAVE emulations in either emulator have other then minor problems." Interesting trivia news posted by GamesTM about 'the company behind the CD-i'... They talked about Syd Mead, a "visual futurist" and concept artist. He is best known for his designs for science-fiction films such as Blade Runner, Aliens and Tron. He actually did a lot of designs and concepts for games and movies for big studios including Hollywood, it's impressive to see his work when you type his name in Google. The link to Philips is because he actually worked for Philips for a long time. In 1970, he launched Syd Mead, Inc. in Detroit, Michigan to accommodate the offers he received, most notably from Philips Electronics. As the principal of his newly formed corporation in the 1970s, Syd Mead spent about a third of his time in Europe, primarily to provide designs and illustrations for Philips of Holland. His work for international clients continues to this day. Syd Mead was actually legendary and a big inspiration source to various game and movie studios. But with the link to Philips Design, the influence of the company in his work and thinking is interesting, as well is his influence on the designs of Philips of that time, which takes up including the CD-i start in the 1980's. This is it, the end of 2011 marks the end of the sixth year of Interactive Dreams and all I can say is: We did it again, together with you, having our small active community with a small dedicated CD-i scene, 20 years after Philips introduced the system to the market. Our archives are still very valuable when I look at our daily statistics. It's been a quiet year again, perhaps it will never be different anymore. The years of Black Moon and Le Monde are way past us, unfortunately. You'll never know what will happen in 2012 on the CD-i front but I can assure you Interactive Dreams will do its best to continue our seventh year reporting all the CD-i news and stuff we dig up. We at Interactive Dreams wish you a very happy Christmas and thank you all for your support.